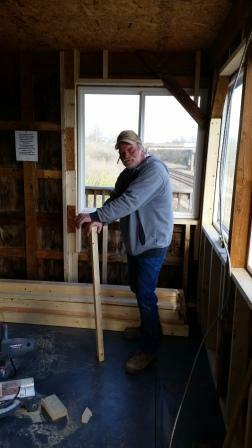 Lookout Point Renovations Going Well!! It is hot out there but things are moving along. The walls are studded in, insulated and covered. Electrical has been updated and the next big project is coming up on July 8th and 9th. 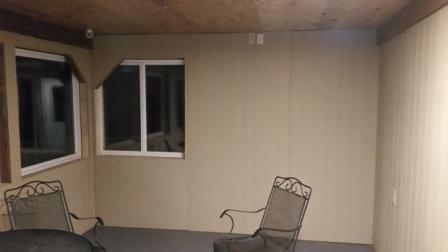 That will be when the new siding and door will be installed. The interior to be finished at that time. After that work weekend. Beautification of the road, entrance, etc will be started on. If you are going to be in the area. Please let us know. We will be glad to have some extra hands. We have had a few donations since February but are still a few hundred dollars shy of the goal. Your help via a donation will be greatly appreciated too. 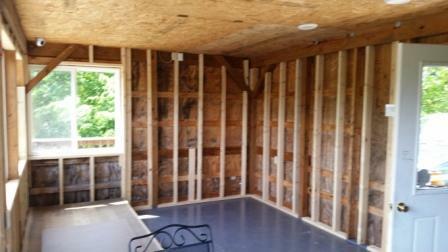 Insulation put in and new walls installed. Things are looking nice. The information center is now in. ATCS monitor and heater will be put back in after the big project is completed. We hope anyone who visits will have a good time and want to come back. There will be some new announcements for this are later this summer. To donate to this project please click here. Mail a check to the APRHF P.O. Box 175 La Plata, Mo 63549. Stop by the Depot Inn & Suites and give them a check or cash at the front desk and tell them it is for the Lookout Point. If you have any questions about this project, or any of our other projects, please email me at president@aprhf.org.